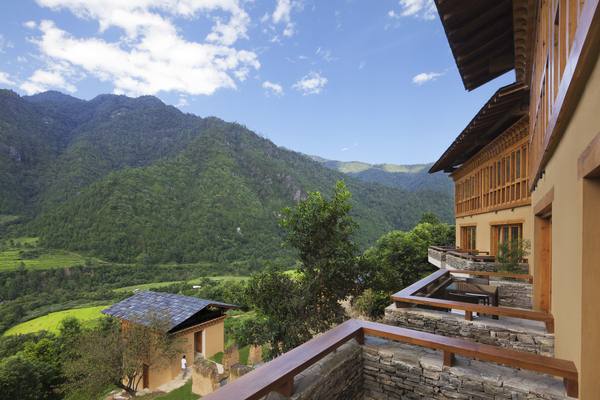 In the alluring landscape of the Punakha Valley surrounded by picturesque mountain ranges lies Uma by COMO Punakha. 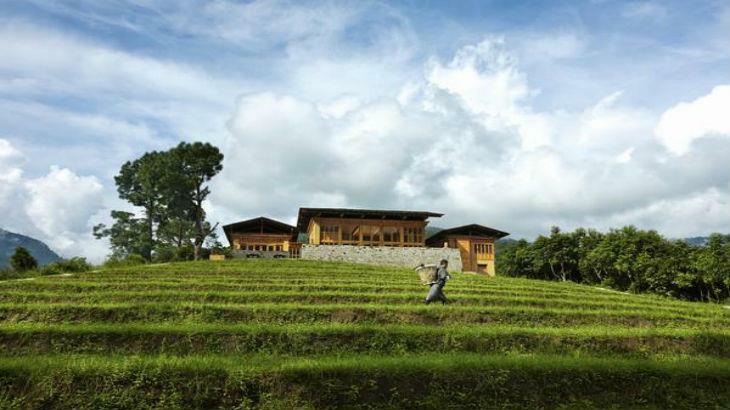 This 5-star luxury resort sits neatly on a hillside in a secluded region of the Bhutan Kingdom. This distinguished hotel overlooks a bend in the snake-like Mo Chu River. Uma Punakha offers 8 gorgeous Valley View rooms, one 1-bedroom villa, and two 2-bedroom villas that are perfect for an amazing visit to this picturesque country. 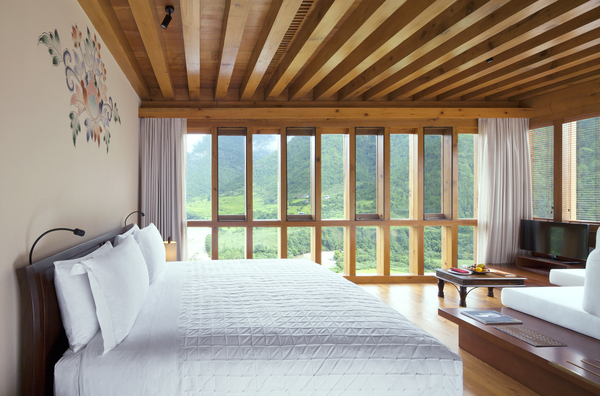 Uma Punakha includes several inviting room features for each guest, which includes air-conditioning, Egyptian cotton sheets, complimentary bottled water, an electronic personal safe, a minibar, coffee and tea-making facilities, umbrellas, yoga mats, hairdryers, bathroom amenities, and Wi-Fi access. 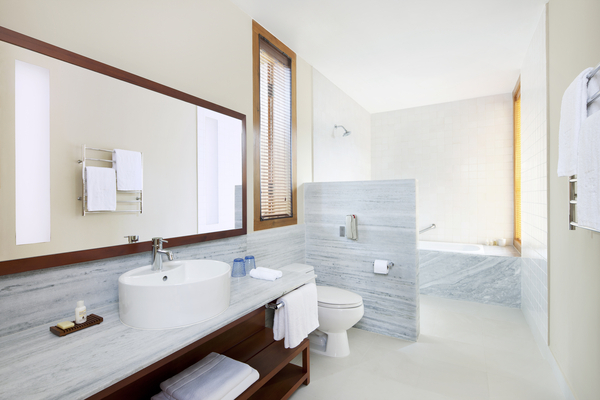 The resort is also a licensed travel agency and can handle more than just your hotel arrangements. 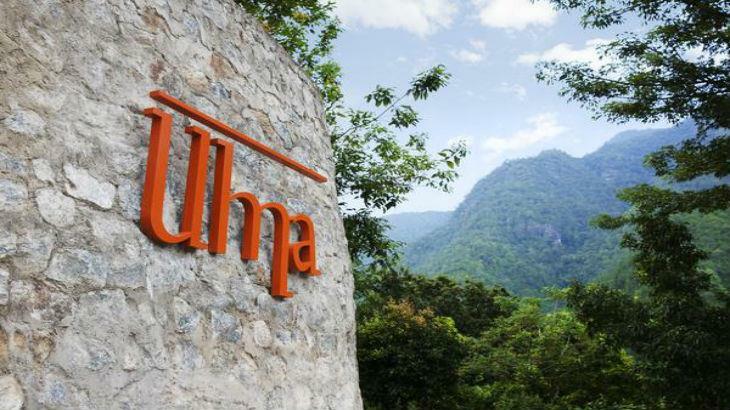 Uma Punakha can also arrange to have English-speaking guided tours, trekking services, foreign money exchanged, babysitting services with a 24-hour notice, and private cars and drivers. 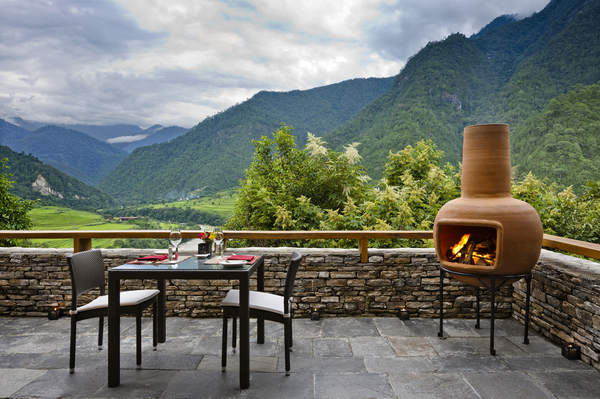 At Uma Punakha, Bukhari, named for a Bhutanese fireplace is one of the best restaurants in Bhutan. Chef Dewa Wijawa is an expert at creating authentic international and Bhutanese cuisine. The menu is loaded with plenty of healthy menu options. The restaurant is open for breakfast, lunch, and dinner and meals are prepared with locally grown fresh produce. The Bukhari staff can accommodate guests that prefer private dining or room service. 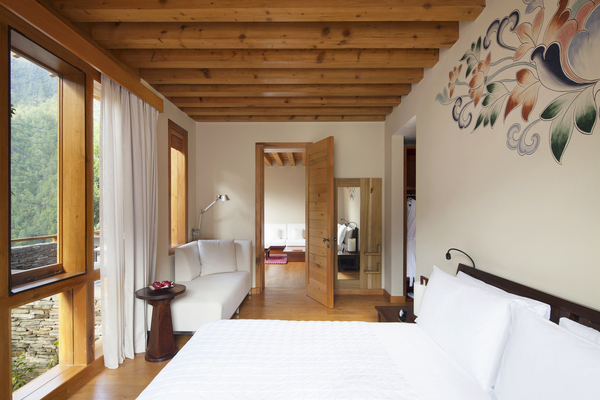 Staying at Uma by COMO Punakha will surround you with the heart of the Bhutan culture, tradition, and beauty. What better way to understand the richness of the Bhutanese culture than to enjoy the elaborate Punakha festivals. The 9-day event, Punakha Drubchen and Tshechu festivals are a celebration of victory over the Tibetan army in the 17th century. The reenactment allows young men and women from nearby villages to perform impressive folk dances in front of the Chief Abbot of Bhutan. Some dancers wear handmade wooden masks during their performances. The Bhutanese believe that the Punakha festival is a reminder of their rich history and keeps their ancient culture alive. 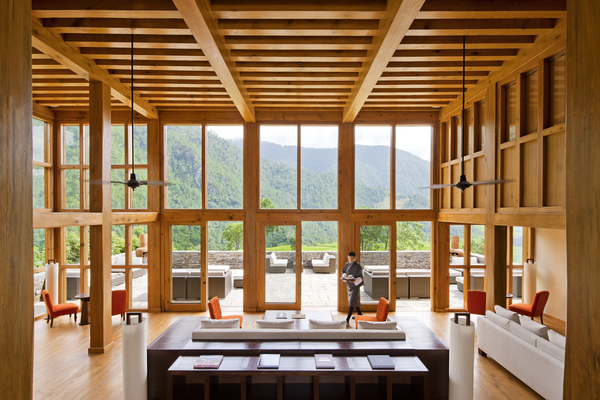 There is a wide range of indoor and outdoor activities that are suited for everyone who visits Bhutan. 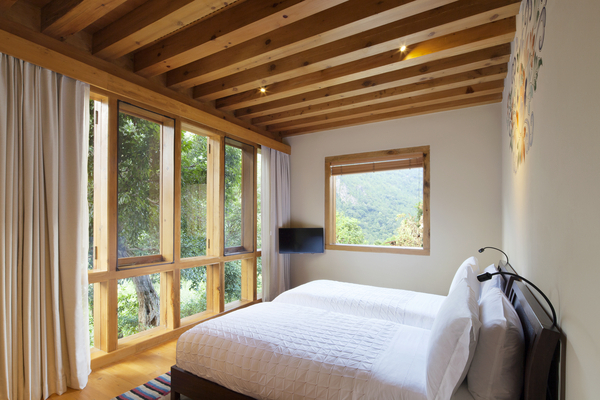 Near the Uma Punakha, you can relax all day at the COMO Shambhala Retreat. Easily enjoy a traditional Asian-inspired massage, facial treatment, or a restorative body therapy session. 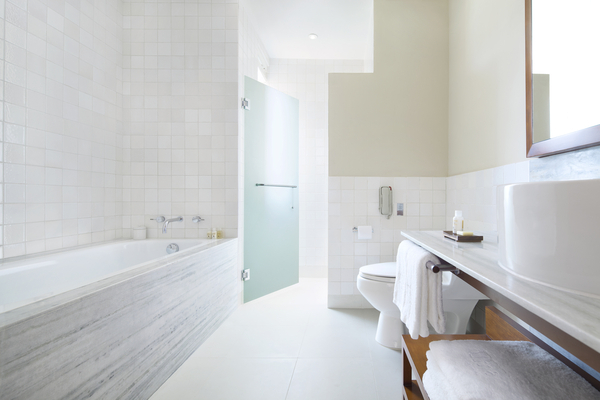 Take a hot stone bath while you savor the peaceful environment and lavish in the awe-inspiring view. For more adventurous spirits, white-water rafting down the Pho Chu River is available. Even though the rafting trips are on gentle rivers, you will have the experience of a lifetime. You can expect to see the Punakha Dzong, ancient monasteries, native wildlife, and astonishing scenery. 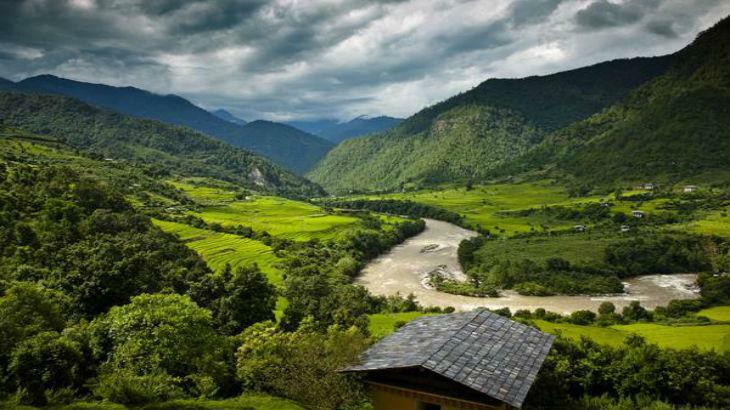 There are quite a few day hikes throughout Punakha Valley as well as overnight trips. Day hikes may take you on a journey through a village or two and then to a Buddhist temple or monastery. These treks can take you from one to four hours. The overnight hikes cover the Paro, Thimpu, Punakha, and Gangtey territories. The 7-21 day guided tours will allow you to experience and get a better understanding of the Bhutanese life and traditions. 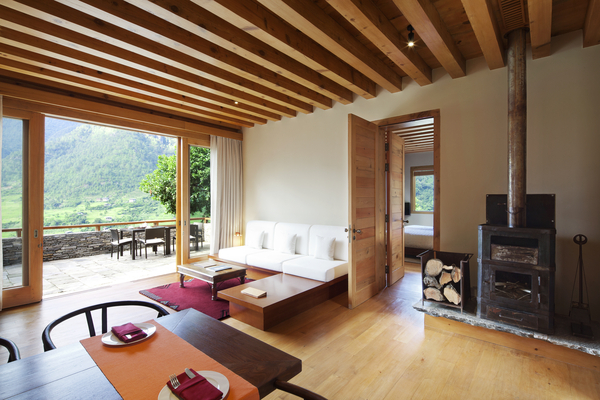 Plan your trip to Bhutan and stay at the Uma by COMO Punakha. Druk Asia Tours & Treks can reserve your hotel and flight travel, customize your itinerary, and arrange guided tours for the duration of your vacation.